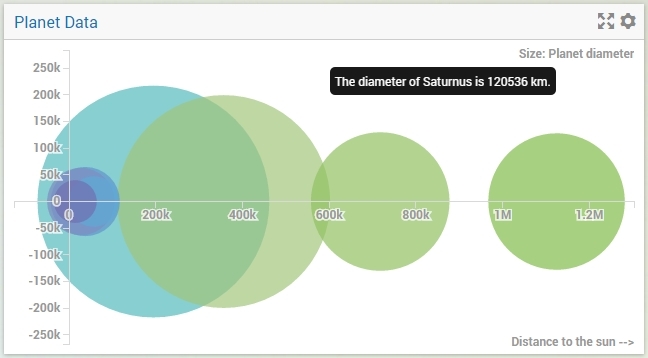 The Bubble Chart widget offers the possibility to display 3 aspects of information about set elements in your model. It uses an X/Y-plane to display circles (the so-called bubbles) for each data point. The size of the circles also provides information about the data points. For example, in a bubble chart about project management, the X-axis could represent the time to complete, the Y-axis the projected profit and the sizes of the bubbles could depict the risk involved. The capacity and performance of the bubble widget may depend on the specifications of your user’s machine, server and database speed, and the browser being used, among other factors. In this particular case, the Y-coordinate doesn’t mean anything. In such cases, just set it to a constant value. In your bubble chart you would have to specify the 3 parameters in the order given above. Using real ‘world’ data could result in the following bubble chart. The coloring of the individual bubbles in a bubble chart is determined by the last index that you have specified on the Groups tab of the options editor. For example, if you have a bubble chart with bubbles based on identifiers with a 3-dimensional index, let’s say years, countries and seasons, and pivot the chart such that the years index is the last one, all bubbles with the same year will be colored equally. X-axis label: here you can specify a literal string or a model identifier to use as a legend which will be displayed along the X-axis. Y-axis label: the same, only this time for the Y-axis. Size label: here you can specify a literal string or a model identifier to describe what piece of information is used as the bubble size. It is displayed in the top-right corner of your bubble chart. The axis scaling may include standard abbreviations of quantities, such as k for thousands, or M for millions. If there are bubbles with a negative size, they are rendered as empty circles, as opposed to the filled positive values. Bubbles with a size of 0 are not rendered. The area of the bubbles depict their relative sizes, not their diameter. Please note that the scale of the bubble areas is unrelated to the scale on the X- and/or Y-axis. Only their relative sizes are important. You can specify reverse links on the ‘Store focus’ tab of the widget’s option editor. When you select a bubble in the chart, the element parameters that you specify here will be filled accordingly, opening up all kinds of interactive opportunities.